Popular grandstands sell out fast. Buy Belgian Grand Prix tickets from these official retailers. Spa is a great place to watch live Formula One and there are satisfying options for all price ranges. Of course if you go to Spa you’ll want to see the cars take on the mighty Eau Rouge, one of motor racing’s most famous pieces of asphalt. If your budget allows I highly recommend doing this, though if the cost of the tickets makes your eyes water there are some pretty decent alternatives that won’t break the bank. Choosing a grandstand for the Belgian Grand Prix you really need to look beyond the price tag. Some mid-priced grandstands offer very good views while there are some high-priced grandstands that many fans are left disappointed by, so it’s worth arming yourself with this knowledge before you book any tickets. Spa Francorchamps has many great vantage points to watch the race but the venue does have an equality problem with its grandstands. Sometimes choosing the right section of a grandstand can be as important as choosing the right grandstand. 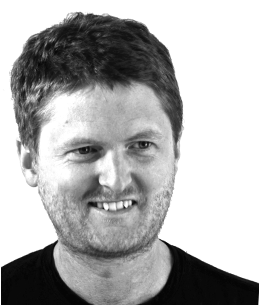 My advice is to book early and contact your ticket provider to request the seats you want. Ticket providers like the ones listed on this page will do their best to honour these requests if there is availability. 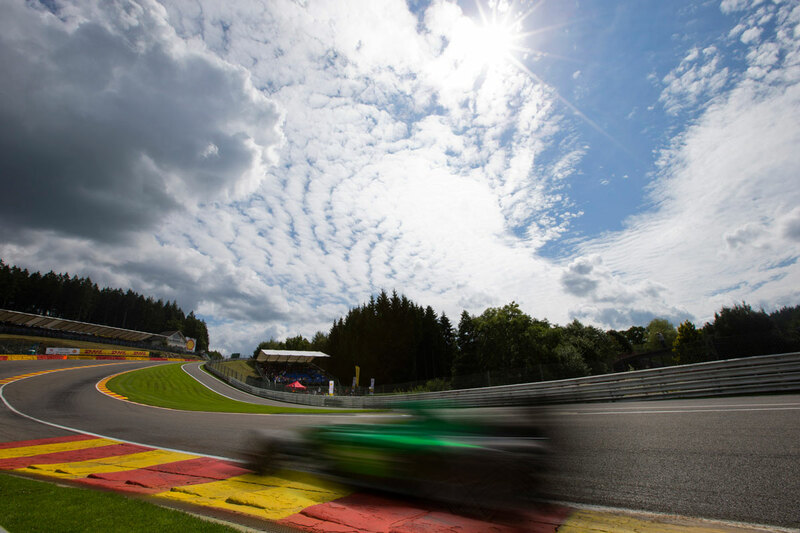 There’s no Formula One start quite like Spa and these are the best grandstands to watch it from. After a short sprint from the grid drivers funnel into the tight La Source hairpin leaving you to wonder just how exactly did they all got round cleanly. Many times they don’t of course, and if you’ve ever wanted to see a flying F1 car this is one of the best places to do so; it was here on the opening lap in 2018 that Fernando Alonso got airborne and swiped across Charles Leclerc’s Sauber, coming to a rest in front of the grandstands. After seeing the cars brake into turn 1, watch them accelerate away down the back straight. You’ll see Eau Rouge in the distance albeit somewhat obstructed by the pit buildings. After the race you’re in a great spot to join the track invasion and see the podium celebrations. The hands down winner of the La Source grandstands is Gold 8. Its view of the grid, though distant lets you enjoy the excitement of the build up to the race and you’ll see the winner take the chequered flag 90 minutes later. You also have a head on view down the pit lane, and the pit exit right in front of you. The view of the track is partially covered by the wire mesh fencing and the large run off area means you’re a little distant from the track, but all round this is easily one of the best grandstands at Spa and sells out fast. Though it neighbors Gold 8, Gold 7 is a world away in terms of what you can see, being situated too far around the hairpin to have views of the start/finish line. Spectators here do have excellent views of La Source and are closer to the track but sadly the safety fence almost entirely covers the visible track area. The straight between the La Source hairpin and Eau Rouge is where the original starting grid was at Spa Francorchamps. Grandstands here have views of Eau Rouge and are the closest to the F1 Village, so you’ll never have to go far to chow down on some more waffles. Either side of the Gold 2 Grandstand, Silver 1 and 2 feel like sibling grandstands. They occupy the same price range, have the same style of seating, are uncovered and each look over views of the track stretching from La Source to Eau Rouge. There’s a clear favourite though and it isn’t this one. Where Silver 1 excels is it’s position nearer to the hairpin and the pitlane exit. From here fans can watch cars go from crawling speeds up to about 300 kph by the time they turn into Raidillon and won’t lift until Les Combes. But being closer to La Source of course means being further away from Eau Rouge and that’s if you can see it at all. It’s a long grandstand and what you can see from where your seats are can be a bit of a lottery. Avoid the blocks on either end of the grandstand as well as rows at the back and front. At the La Source end fans in the end block have some very intrusive catch fencing to contend with while at the other end views towards Eau Rouge are cut off by buildings and the neighboring Gold 2 grandstand. Though not as impressive as its overachieving sibling, most of the Silver 1 Grandstand provides a view that is perfectly acceptable. Its definitely worth being aware of these issues though and make your preference clear when booking tickets. Well positioned on the back straight, Silver 2 Grandstand is at about the midpoint between La Source and Raidillon and if you can bear the sun and the rain, its one of the best grandstands at the Belgian Grand Prix. 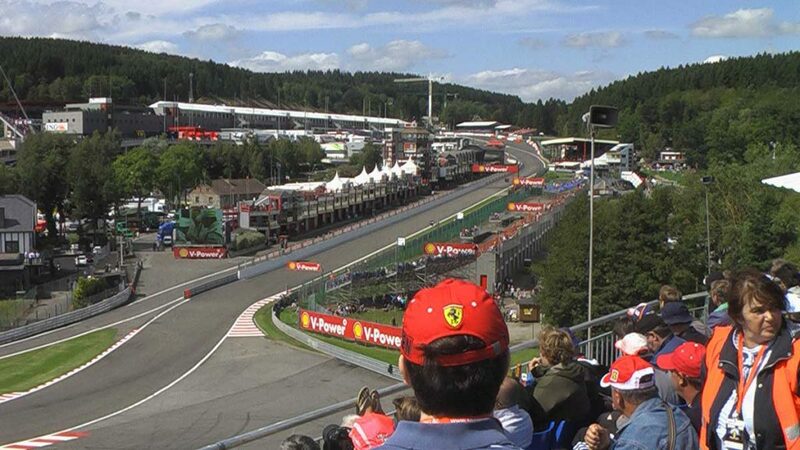 Seats in blocks near Eau Rouge have the best view of the corner, though with the screen usually located at the other end it’s fair to say both ends of the grandstand have their advantages. If you’re looking for a reserved seat with views of Eau Rouge that you won’t need to re-mortgage the house for, Silver 2 is an excellent choice. 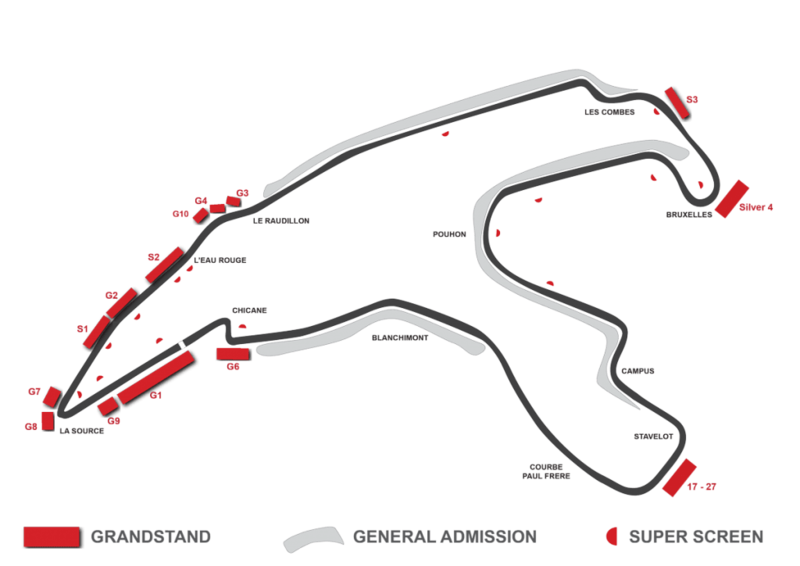 With a couple of caveats Gold 2 is a good, indeed almost a great choice of grandstand at the Belgian Grand Prix. At its best you’ll have a clear view of the track from La Source to Eau Rouge. What really elevates this stand above neighboring grandstands is the level of comfort with not only a roof for the inevitable downpour but the holy grail for F1 fans at Spa: seats with seat backs. Now for those caveats I mentioned. For reasons known only to themselves, organizers have unhelpfully bolted a pointless panel of wireframe fencing to the side of the grandstand. For fans closest to Eau Rouge, this severely compromises views of the famous corner. The other end too has an ungodly amount of fencing, both as part of the grandstand structure and the very necessary safety fencing at the side of the track. At least fans sat here do have clear views of Eau Rouge. This is a large grandstand though and you’d have to be quite unlucky to end up in bad seats. The best thing you can do is book early and request your seat preference from your ticket provider. Perhaps no section of track is as iconic in Formula One as this flat out left-right-left combination, and for many its what attracts them to visit the Belgian Grand Prix in the first place. Known to most F1 fans simply as Eau Rouge, the more informed (and dare I say pedantic) will tell you this is actually two distinct corners. The slight downhill left crossing the Eau Rouge stream (literally ‘red water’) and then the epic climb and the blind crest of Raidillon. From entry to exit onto the Kemmel Straight the track rises a staggering 40.8 metres with an elevation of 18 degrees at its steepest point, something that’s not obvious watching on television but jaw-droppingly clear when you visit the track. Getting this part right is crucial for a good lap time, exit speed making all the difference for the the long straight that follows. Sometimes drivers approach Eau Rouge with a little too much exuberance though. It was here in 1999 that both BAR drivers lost control of their cars in separate accidents with spectacular results. Jaques Villeneuve, like a connoisseur of destruction, later called it “my best ever crash”. Its possible to see Eau Rouge from grandstands on the back straight too but Gold 3, Gold 4 and Gold 10 grandstands are closest to the corner. With one major caveat, Gold 3 is a great grandstand for viewing Eau Rouge. Positioned about mid-way up the assent to the Kemmel Straight it points down the hill, allowing for a wide view of the cars all the way from La Source, up the hill to where they flash past right in front of the grandstand. Gold 3 is covered meaning you’ll have protection from the sun and your view won’t be affected by a sea of umbrellas if it rains. There are some drawbacks though. The low angle of elevation of this stand, coupled with the slope of the track, makes getting a clear view difficult for fans further back as the cars disappear from view on the ascent up the hill. This is a huge frustration for anyone further back than about row 10. Some fans even opt to watch from an area beside the stand to get a better view but having paid for a reserved seat, jostling for space and exposed to the elements is far from ideal. If you still like the sound of the Gold 3 grandstand the best thing you can do to ensure you get the best seats is to book early and request seats in the front rows of the stand. Gold 4 is arguably the best grandstand at Eau Rouge for actual track views, though lacking in other respects. The grandstand offers a more side on, wider angled view of Eau Rouge, allowing a more prolonged view of this famous piece of track. The view is dramatic and the cars seem so close at this point of the corner that you feel you could almost reach out and touch them. The grandstand isn’t covered which is a bit of an issue for visibility when the umbrellas go up as they almost inevitably will at some point. For the best views in Gold 4, try to get a seat high up on the side nearest the pit complex. Lower down near the entry to Eau Rouge, the Gold 10 Grandstand is another covered option at this corner. Unlike at Gold 3, here you are looking up to Raidillon so being further back in the stand won’t affect your view, if anything back rows are a better choice with less catch fencing to contend with. The clear disadvantage of this grandstand are the trees that partially block your view down the straight to La Source. It may not be the most well known corner at the circuit but the view from the Silver 3 Grandstand at Pouhon just screams Spa Francorchamps. The grandstand is at the interior of the track at the fast, double right-hander and fans here can see all the way to turn 13. 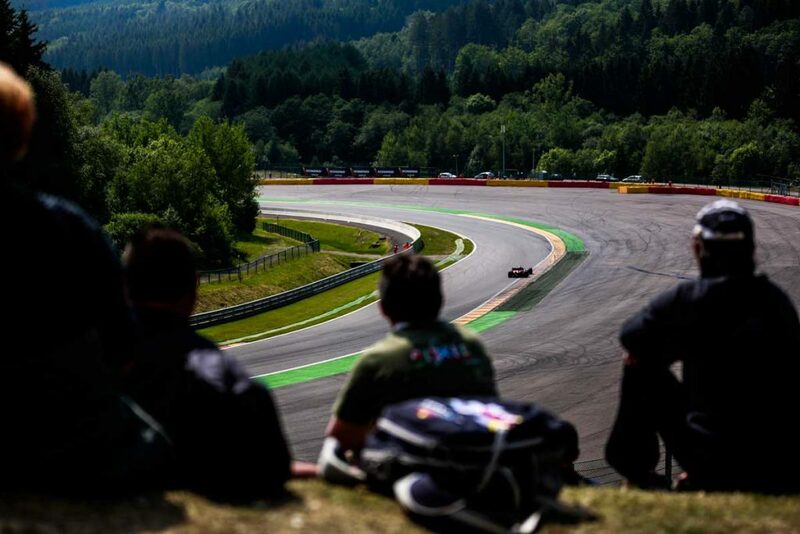 Watching at this sweeping section of track is how Formula One cars are meant to be seen and the backdrop of the Ardenne woodland is majestic. Specators here are a long way from the heart of the circuit, the F1 Village and the bulk of the food and drinks vendors, but if you’re okay with that and you’re okay with not having a view of Eau Rouge then you could do a lot worse than the Silver 3 Grandstand. Underwhelming is the word for this single corner view from the Silver 4 Grandstand. Its a prime spot to watch the long approach to the Bruxelles corner, a downhill right-hander. This is by no means a poor view – you have a clear view of the track without any annoying catch fencing and you can get some nice shots for your Instagram of the front and sides of the cars. Its not terrible, it just isn’t particularly memorable. And a visit to Spa should be memorable. Located at the exit to the fast (well duh) Speed corner, this grandstand is a low budget option which while basic, isn’t without its charms. It can feel a bit monotonous after a while and you’re unlikely to see any wheel to wheel action and overtaking. Comfort is minimal with old style wooden bleachers and no roof leaves you exposed to all weathers. Still, if you don’t mind some splinters in your bum and the occasional soaking, it is a good spot to appreciate the speed and noise of an F1 car and (hallelujah!) there’s no annoying fence to spoil the view. If you’re lucky enough to be aged between 17 and 27 and you’re considering general admission, its a no brainer to upgrade your experience and buy tickets for this grandstand overlooking Blanchimont. With these tickets you have all the benefits of general admission and are free to explore the circuit, plus access this grandstand overlooking the two medium speed, sweeping right-handers. Just bare in mind these seats aren’t reserved so go easy on the Jägerbombs the night before and get up early to bag the best spot. Between track sessions there’s a ‘mini festival’ where DJs will be laying down some cool vibes, spinning some sick beats and just generally having a nice time with the drum and the bass and whatnot. Whether that’s your scene or not it all adds to the atmosphere in this part of the circuit and if its all just noise to you, rest assured, it will let up in favour of a more agreeable kind of noise when the racing starts. With the chicane just a few feet away there’s no doubting the exciting views Gold 6 provides. You’ll see passing attempts here and drivers missing their braking points – or worse. If you can sense a ‘but’ coming you’re right. The catch fencing feels annoyingly close, especially in the lower rows and the not-so-giant-screen is hard to make out. Views from the nearby general admission area are better and although they lack certain benefits such as a reserved seat, dedicated toilets and a roof over your head, you have to question this grandstand’s Gold status. Gold 1 comes with all the usual array of perks you’d expect from a main straight grandstand; watching the activity in the pitlane, the podium ceremony, interviews with the drivers and of course the grid preparations. Being a short straight you can also make out the exit of the final chicane and the entry to La Source. The best seats, closer to the chicane (blocks A-F) have direct views of the podium, parc ferme and even a glimpse of Eau Rouge. This view of F1’s most iconic pieces of asphalt, though brief, adds another dynamic to the view from here. The higher of these rows also have the cleanest view to the cars, unspoiled by fencing – where they exit the chicane the drivers are on the extreme right of the track but as they follow the racing line over to the left hand side, fans nearer La Source have a fence between their line of sight and the cars making for some less appealing photographs. More important for some though is to have a clear view of the giant screens that many fans have trouble seeing from here. Indeed if following the race is something that matters to you more than the grandstands many advantages, you might want to consider another grandstand (although there is reasonably good wifi at the circuit, its not always reliable). Feeling in need of some refreshment? There is a solitary tap nearby to refill water bottles but not a lot else. Unusually for a Grand Prix circuit the main food, drinks and merchandise stalls are not located close to the main straight but behind the grandstands that line the back straight, so its a little bit of a walk. That said, with the hard plastic backless seats that this grandstand is fitted with, a walk might be very welcome. If close up views of the grid are important to you then this is not the best grandstand (that would be Gold 1). The grid is off the the right of your field of vision and while it is a good place to watch the start and finish you won’t see much of the race build up. What you get in the Gold 9 grandstand are views of the pit garages that house the smaller teams (and under performing large teams, ie. McLaren). The short run to turn one means you’ll also get a rear on view of cars entering the La Source hairpin. Unlike many Grand Prix where you are limited to a single corner view you can come away from Spa Francorchamps saying you really saw all of it. There’s heaps of variety and choice for spectators in general admission (called Bronze at Spa) and the views of the track are good. If you’re prepared to get out of your sleeping bag early there are some great spots to be had and some that would even give certain grandstands a run for their money. As at any Grand Prix, take the time over the Friday to see as much as you can, and go to the track on Sunday with some kind of plan. Gates open at 8am but for the best places aim to be there well before that time. Of course Eau Rouge isn’t the only turn at Spa and other sections are very popular. Perhaps the best general admission area at Spa is to get yourself a spot on the grassy hill at Pouhon. From here you have a view of a series of high speed turns that make up the ‘new’ portion of the track. There are numerous giant screens to help you follow the race. Get to the track early and bag yourself a place high up on the hill for a wider view and less trouble with having your view blocked by the safety fence and advertising hoardings that line the track. It’s one of the favorite places for Spa regulars owing to it’s wide sweeping views and lively atmosphere. These veteran F1 spectators even bring small spades to dig a little hole or ridge in the side of the hill to allow a nice horizontal seating position for their camping chairs. It’s worth spending at least a bit of time at the Bus Stop chicane – the final chicane before the start/finish straight – especially if you’re not averse to a bit of rock climbing. Here the cars are quite close to you and you get to experience the fast changes of direction as the drivers weave a line through this section. You’ll also see the pit entry and will be in a prime location for a track invasion at the end of the race. It is possible to view Eau Rouge from general admission, though it’s probably not somewhere you’ll want to spend the whole race. There is a spot to the right of Grandstand Gold 4, though your view is obstructed a bit by the catch-fencing. You can also catch a distant, rear facing view of the iconic section from the F1 Village where all the merchandise and refreshment stalls are located.